According to the Intergovernmental Panel on Climate Change (IPCC) agriculture is responsible for a major portion of the increase of greenhouse gases. Not all agriculture has the same impact, however—the vast majority of the effect comes from the post WWII industrial agricultural system. This system—an agricultural model based on capital concentration, high fossil energy consumption, overproduction, consumerism and trade liberalization—has put our planet’s ecosystems at risk and pushed human communities toward disaster. Industrialized countries and the industrialization of agriculture are the biggest contributors to global warming, but it is farmers and rural communities—especially in developing countries—that are among the first to suffer from climate change. Changing weather patterns bring unknown pests along with unusual droughts, floods and storms, destroying crops, farmlands, farmstock and farmer’s houses. Moreover, plants, animal species and marine life are threatened or disappearing at an unprecedented pace due to the combined effects of warming and industrial exploitation. It is estimated that by 2080, Latin America will likely see a 24.3 percent decline agricultural yields, Asia 19.3 percent and Africa 27.5 percent. Life at large is endangered by the decreasing availability of fresh water resources. By 2050 an estimated 4 billion people will live in highly water-stressed environments. In tropical regions, global warming is likely to lead to a serious decline in agricultural production and to the acceleration of the desertification of farmland. On the other hand, vast regions of Russia and Canada will turn into cropland for the first time in human history. Yet it is still unknown how these regions will be able to grow crops. Farmers have to adjust to these changes by adapting their seeds and usual production systems to an unpredictable situation. What is expected is that millions of farmers will be displaced from the land. Such shifting is regarded by industry as a business opportunity to increase food exports and imports, when the reality is that hunger and dependency will only increase around the world. 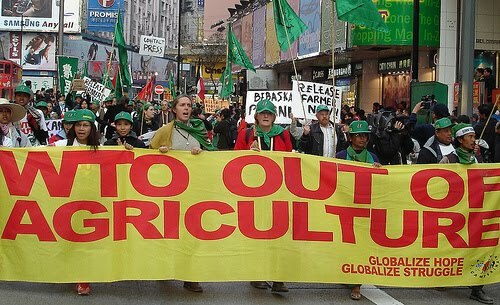 Via Campesina, a transcontinental movement bringing together of small farmers and producers, asserts that it is time to radically change the industrial way to produce, transform, trade and consume food and agricultural products. We believe that sustainable small-scale farming and local food consumption will help reverse the devastation and support millions of farming families. Agriculture can also cool down the earth by using farming practices that store CO2 and reduce the use of energy on farms. Fresh and packaged food is being shipped thousands of miles, while local farmers are denied appropriate access to local and national markets. In Europe and the United States, for example, it is now common to find fruits, vegetables, meat or wine from Africa, South America or Oceania. In the Americas or Africa it is easy to find Asian rice. Fossil fuels used for food transport are releasing tons of carbon dioxide into the atmosphere. In fact, the Swiss peasants’ organization UNITERRE calculated that one kilo of asparagus imported from Mexico needs 5 liters of oil to travel by plane (11,800km) to Switzerland, while a kilo of asparagus produced in Switzerland only needs 0.3 liters of oil to reach the consumer. The use of fertilizers and pesticides—so-called “modernized” agriculture—is destroying natural soil processes and resulting in carbon deposits in soil organic matter. Due notably to the use of chemical fertilizers, intensive agriculture and animal production monocultures produce significant quantities of nitrous oxide (NO2), a noxious greenhouse gas. In Europe, 40 percent of the energy consumed on the farm comes from the production of these nitrogen fertilizers. Carbon is captured from the air by plants and stocked in wood and organic matter in the soil. Some ecosystems including native forests, peat lands and meadows stock more carbon than others. This carbon cycle has been part of the climate balance for thousands of years, but corporate agribusiness has now shattered this balance by imposing widespread chemical agriculture (with massive use of oil-based pesticides and fertilizers), by burning forests for monoculture plantations and by destroying peat lands and biodiversity. Forests, pastures and cultivated lands are rapidly being converted into industrial agricultural production areas or into shopping malls, industrial complexes, housing developments, large infrastructure projects and tourist resorts. This causes massive carbon emissions and reduces the capacity of the environment to absorb the carbon released into the atmosphere. In terms of energy conversion, the first role of plants and agriculture is to transform solar energy into energy in the form of sugars and cellulose that can be directly absorbed in food or transformed by animals into animal products. This is a natural process, which brings energy into the food chain. However, the industrialization process of agriculture over the last two centuries has lead to a consumption economy rather than production one. Agrofuels (fuels produced from plants, agriculture and forestry) are often presented as one of the solutions to the current energy crisis. Under the Kyoto Protocol, 20 percent of the global energy consumption should come from renewable sources by 2020; this includes agrofuels. However, leaving aside the ethics of producing food to feed cars while so many people are starving, industrial agrofuel production will actually increase the effects of global warming instead of reducing them. Intensive agrofuel production is not a solution to global warming, nor will it solve the global crisis in the agricultural sector. The impacts will again be felt most seriously in developing countries, as industrialized countries will not be able to cover their agrofuel demand and will need to import huge amounts from the Global South. Under the Kyoto Protocol and other international schemes, “carbon trading” is presented as a solution for global warming. It is a privatization of carbon after the privatization of land, air, seeds, water and other resources. It allows governments to allocate permits to big industrial polluters so they can trade “rights to pollute” amongst themselves. Some other programs encourage industrialized countries to finance cheap carbon dumps such as large-scale plantations in the Global South as a way to stall the reductions of their own emissions. This allows companies to make a double profit while claiming falsely that they contribute to carbon sequestration. On the other hand, parts of Asia, Africa and Latin America are being treated as mere carbon sinks and privatized through the so-called sale of environmental services, thus kicking communities out of their land and reducing their access to their own forests, fields and rivers. Genetically modified trees and crops are now being developed for agrofuel production. Genetically modified organisms will not solve any environmental crisis as they themselves pose a risk to the environment as well as to health and safety. Moreover, they increase corporate control over seeds, depriving farmers of their right to grow, develop, select, diversify and exchange their own seeds. Via Campesina believes that solutions to the current crisis have to emerge from organized social actors that are developing modes of production, trade and consumption based on justice, solidarity and healthy communities. No technological fix will solve the current global environmental and social disaster. A true agrarian reform strengthens small-scale farming, promotes the production of food as the primary use of land and regards food as a basic human right that should not be treated as a commodity. Local food production will stop the unnecessary transportation of food and ensure that what reaches our tables is safe, fresh and nutritious. Food sovereignty is the right of peoples to healthy and culturally appropriate food produced through ecologically sound and sustainable methods, and their right to define their own food and agriculture systems. It puts the aspirations and needs of those who produce, distribute and consume food at the heart of food systems and policies rather than the demands of markets and corporations. Food sovereignty prioritizes local and national economies and markets, empowers peasant and family farmer-driven agriculture, artisan-style fishing, pastoralist-led grazing, and protects food production, distribution and consumption based on environmental, social and economic sustainability. 1. The complete dismantling of agribusiness companies: They are stealing the land of small producers and creating environmental disasters. 2. The replacement of industrialized agriculture and animal production by small-scale sustainable agriculture supported by genuine agrarian reform programs. 3. The banning of all forms of genetic use restriction technologies. 4. The promotion of sustainable energy policies. This includes consuming less energy and decentralizing energy instead of promoting large-scale agrofuel production, as is currently the case. 5. The implementation of agricultural and trade policies at local, national and international levels that support sustainable agriculture and local food consumption. This includes the ban on the kinds of subsidies that lead to the dumping of cheap food on markets. A report, drafted by over 400 scientists and practitioners from across the globe, emphasized that “business as usual is not an option” in regards to the role of agriculture in feeding the people of the world,. The scientists emphasized the need for more agro-ecological practices that are less reliant on technology and more focused on a community’s needs. It is important to add that all attempts to reverse the now well-known problems associated with Global Warming will be in vain if “business as usual” is allowed. Via Campesina's program of extending food sovereignty to all corners of the globe is not only a strategy for feeding the world's population, it is also an integral element in any program to cool the planet.